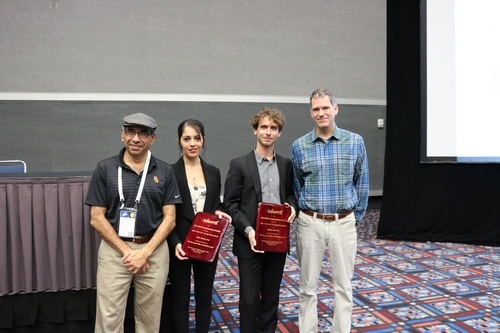 Alberto Del Pia and Aida Khajavirad have been selected as the recipients of the 2017 INFORMS Optimization Society Prize for Young Researchers for their paper "On Decomposability of Multilinear Sets." This work presents novel theoretical contributions with broad algorithmic implications for mixed‐integer polynomial programming, an area of active research in the mixed‐integer nonlinear programming (MINLP) community. On the theoretical side, the decomposition results enhance our understanding of the facial structure of the Boolean quadric polytope and the general multilinear polytope. On the computational side, the proposed optimal decomposition algorithm results in easily verifiable conditions and polynomial cutting plane algorithms that could significantly enhance the performance of MINLP solvers. The work is a milestone in nonconvex optimization. Not only does it represent a breakthrough in the theory of mixed‐integer polynomial optimization but it also holds a great promise for applications of nonlinear and mixed‐integer nonlinear optimization. Michael Ferris (chair), Jonathan Eckstein, Simge Küçükyavuz, Suvrajeet Sen.